Meaning: be going to (do), finish (doing), (do something) completely. 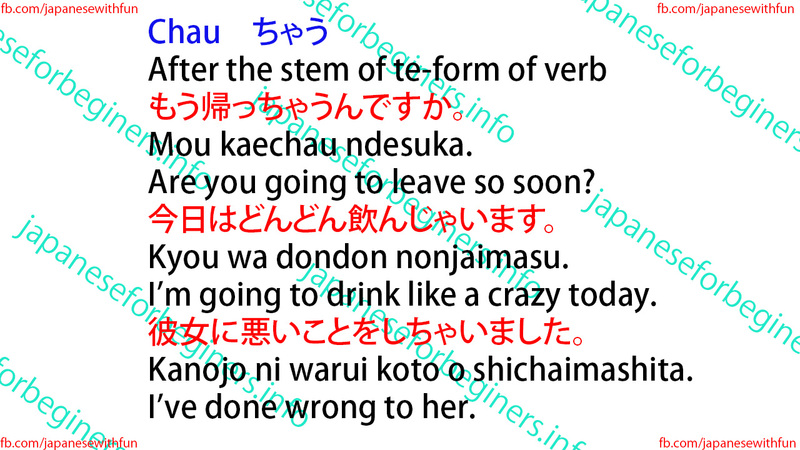 It is used after stem of te-form of verbs whose dictionary form ends with: -u, -ku, -tsu, or –ru. 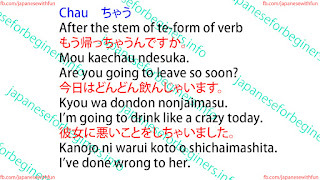 It becomes jau (the informal version of de shimau) after the stem of te-form of verbs whose dictionary form ends with: -bu, -gu, -mu, or –nu. It is sometimes followed by no when forming a question. The past forms are chatta/jatta (plain) and chaimashita/jaimashita (polite). Are you going to leave so soon? I’m going to drink like a crazy today. Kanojo ni warui koto o shichaimashita. I’ve done wrong to her.